Tapco aluminum siding brakes are a sophisticated bending machine that are known by many names. 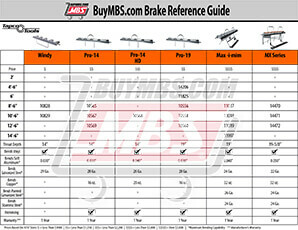 Some of these include: aluminum siding brake, metal brake, Port-O-Bender, sheet metal brake, or trim brake, among others. These brakes are designed to create bends and creases in various metals and other materials, without conjoining them. Tapco brakes can bend materials such as: vinyl, soft aluminum, galvanized steel, trim, and even copper coil, into custom components including soffit, fascia, drip edges, gutter aprons and chimney flashing. Tapco Port-O-Benders are offered in 14”, 19” and 19-5/8" throat depths which allow you to bend a wide range of different sized metals. They are also available in several different lengths ranging from 4’ all the way up to 14’ 6”.The amount and thickness of the materials you need to bend will determine which brake will be best for you. Most of these aluminum siding brakes offer a hemming ability as well, which will let you create a 180-degree bend for more rigid panels.